Kelly and Jimmy’s love story goes all the way back to those days of awkward social interactions and popularity contests: high school! 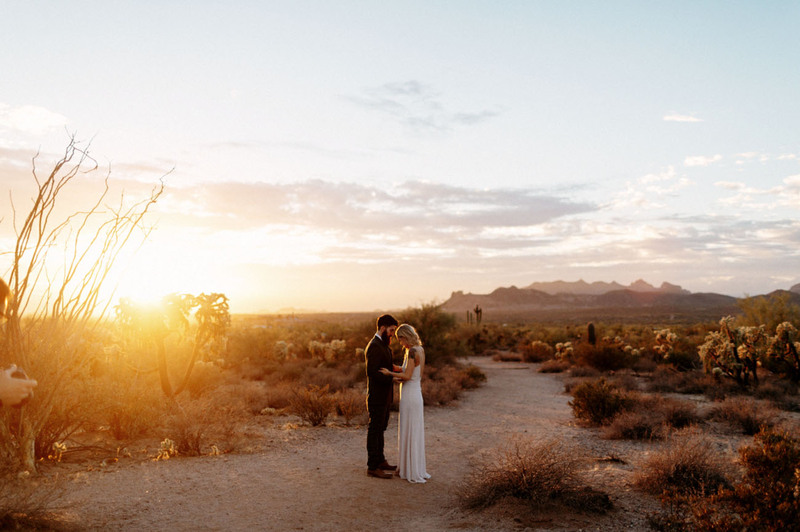 After seven years of dating while finishing school, moving across the country to chase dreams, and finally landing together in Los Angeles, these two sweethearts planned to elope back where they grew up together: the soft desert landscape of Arizona. 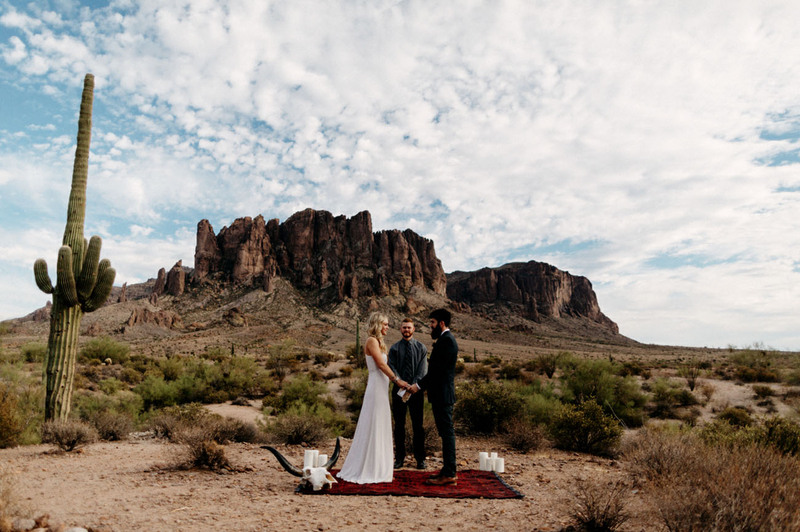 The small ceremony in the Superstition Mountains came together like magic, and we’ve got the photos to prove it! 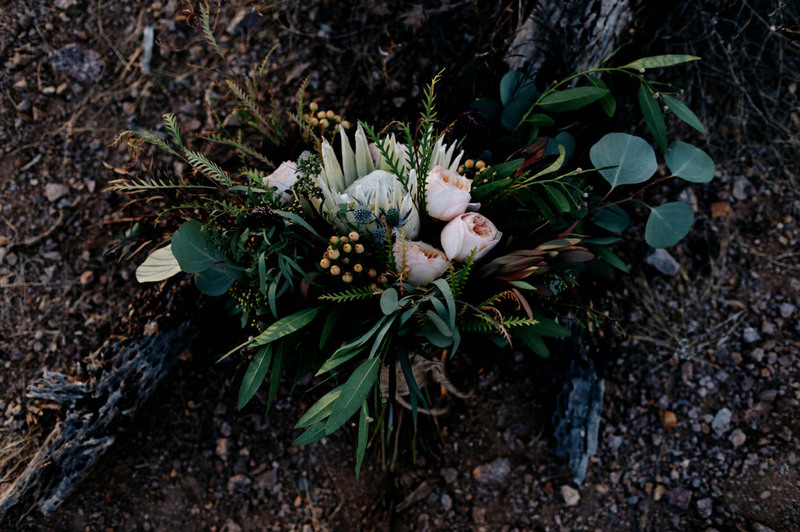 Kelly tells us, The entire day felt so dreamy and effortless, so filled with love and tears of happiness. We are incredibly lucky to have found each other at such a young age and cannot wait to grow old, wrinkly, and even more weird together. 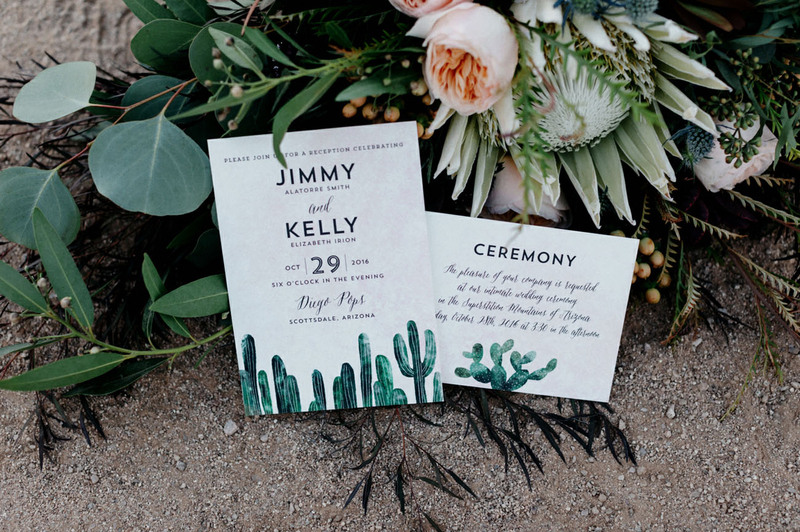 How perfect is this cactus invite the couple customized from Minted?! 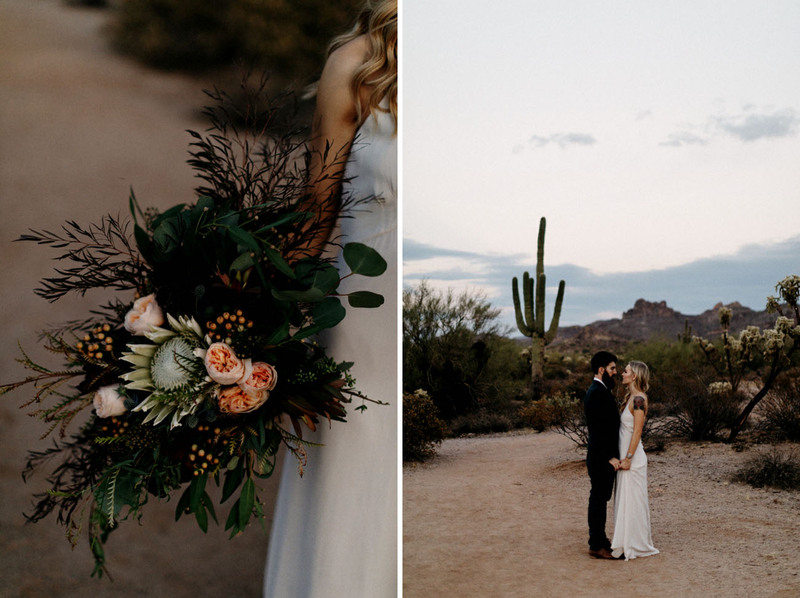 Camelback Floral Shop created this desert-inspired bouquet and we’re loving the dusty color combo! 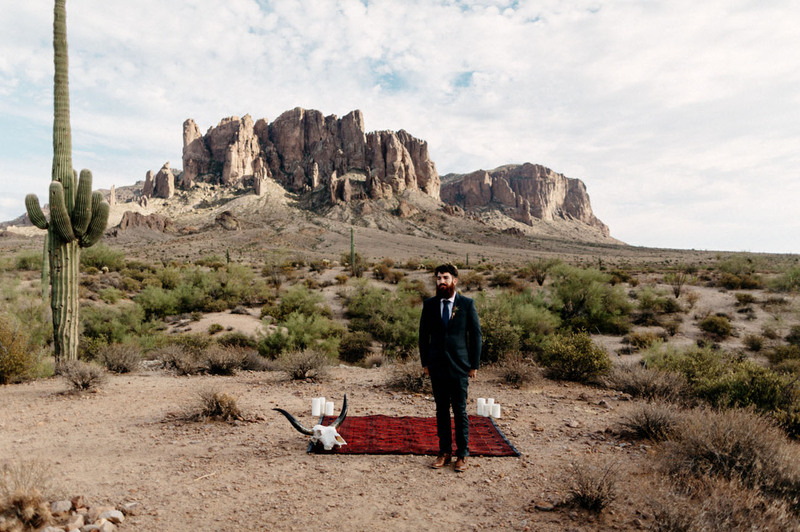 With a backdrop like that, K+J kept the decor simple. 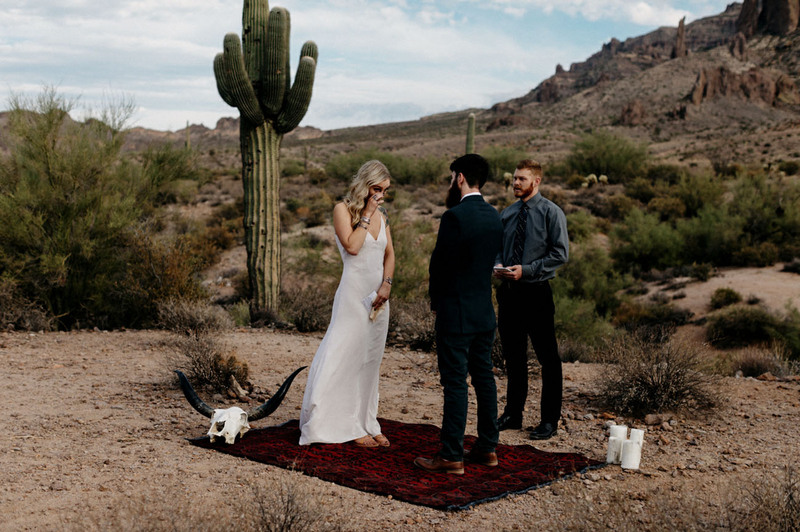 Together, they chose a rug where they’d say their vows then keep it in their home as a reminder of those cherished moments. 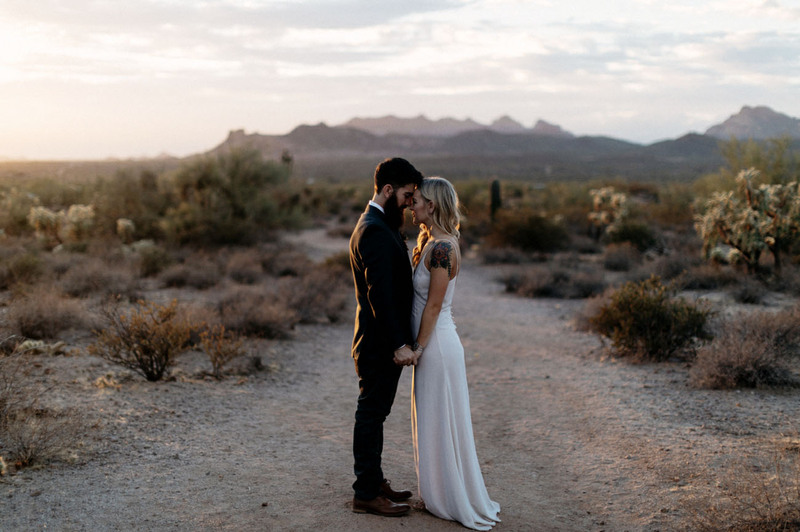 The day of the ceremony, my dad walked me up the trail to meet my soon-to-be-husband as Jeff Buckley’s ‘Hallelujah’ played through the desert. 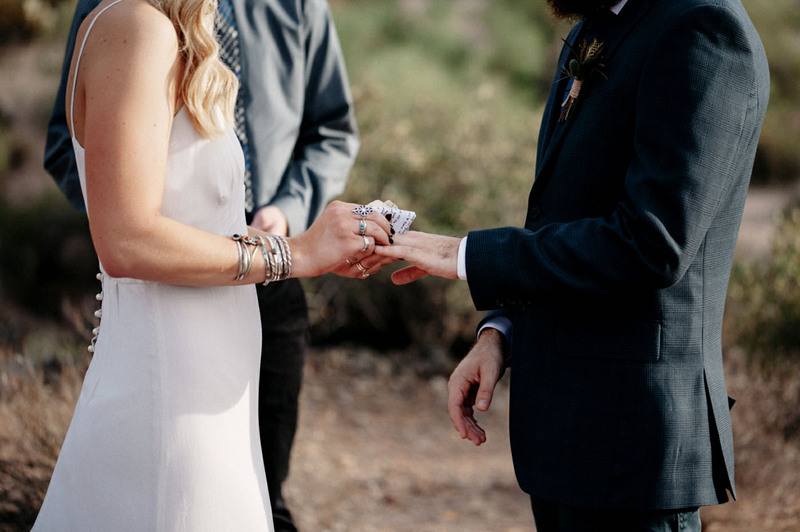 Jimmy and I both decided to write our own vows and filled them with private jokes and nicknames, promises for our future together, and affirmations of our love. 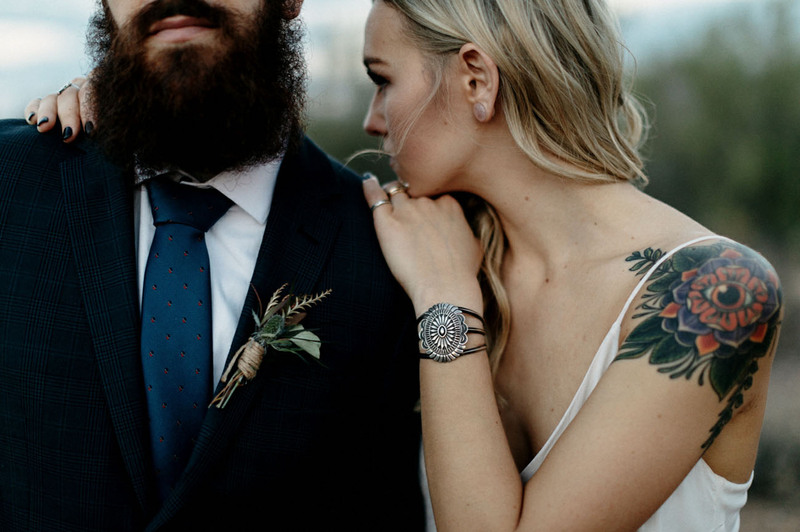 We asked my brother to perform the ceremony and he immediately got ordained online and began working on his speech – which he filled with more jokes and personal accounts of his experience watching us grow as a couple. Throughout the ceremony, the three of us cried together, laughed together, and lived in the moments that lead up to me becoming Mrs. Smith. Crushing on that low back?! Same. 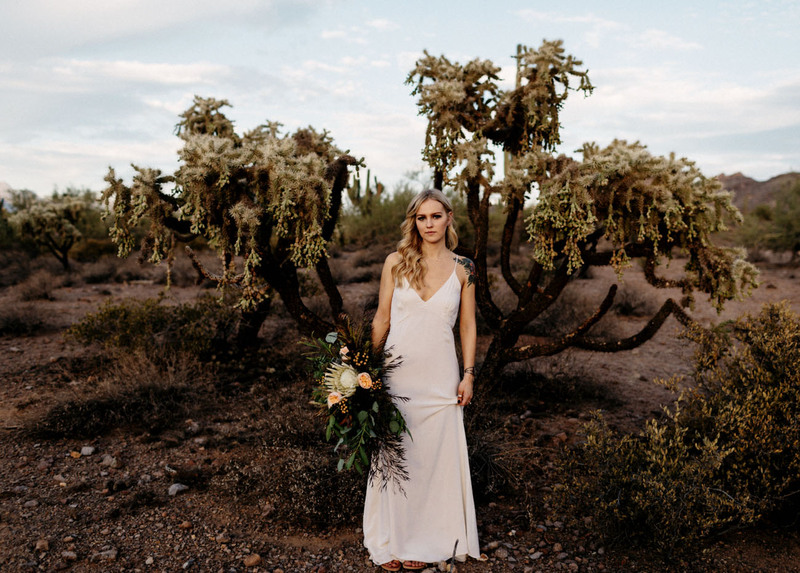 Kelly chose a slip dress from Novella Royale that happens to look just gorgeous against the desert sun. 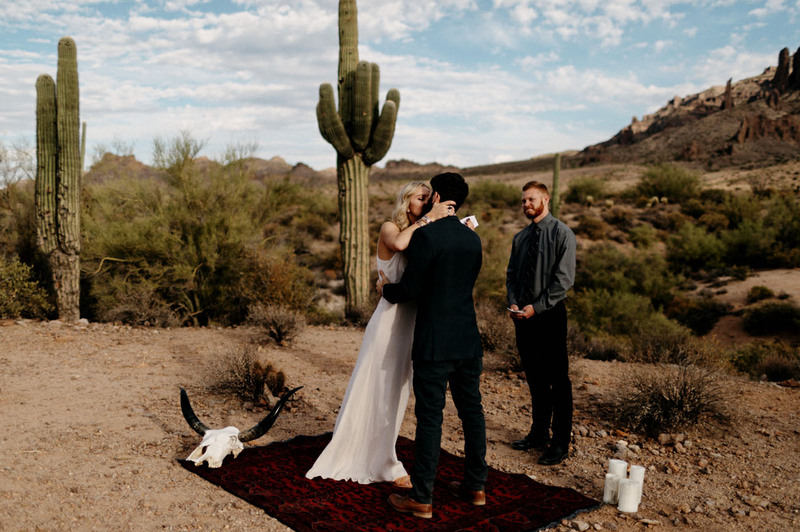 Jimmy and I will forever cherish the time we spent together following the ceremony, roaming through the desert and laughing at the realization that we were finally husband and wife. As I always say to him, he had my first kiss and he’ll have my last. 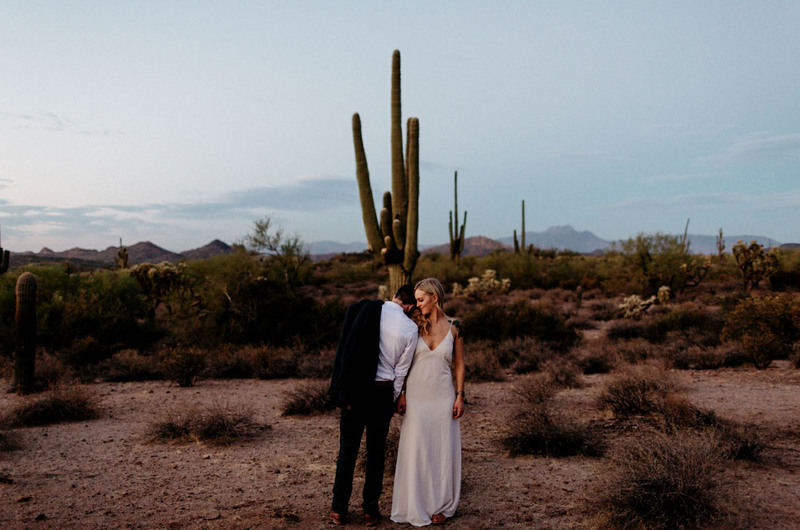 Congrats to K+J and thanks for sharing your dreamy day with us! Beautiful! 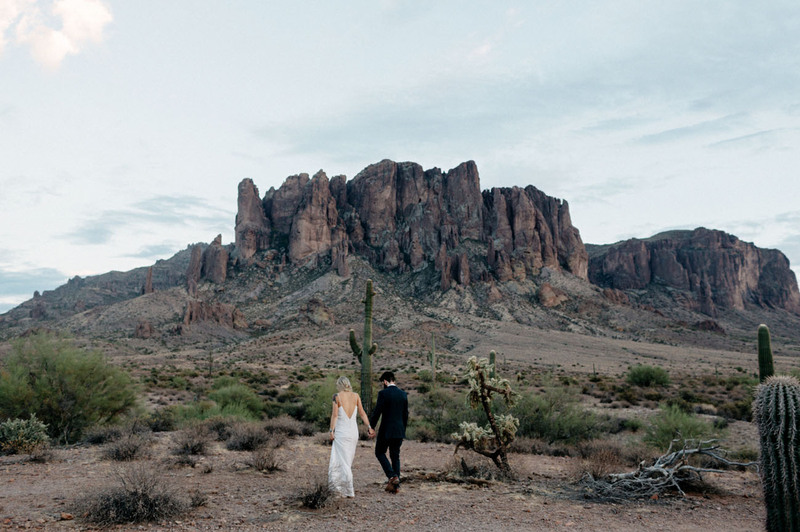 Where is this trail/ backdrop located in the superstition mountains?